A Most Excellent and Authentic Read! 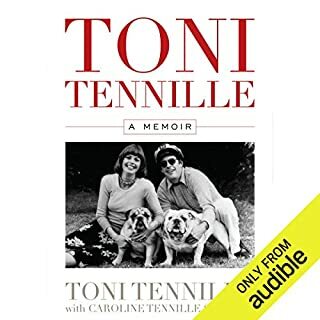 If you could sum up Toni Tennille in three words, what would they be? Ms. Tennille (Toni) is my favorite character. This is her Memoir. She speaks unabashedly about her family and life's journey. She has been able to convey the reasons her marriage ended with ex-husband (Daryl Dragon) without "throwing him under the bus." Of course, she speaks about her entire life's journey, so reading the Memoir and/or listening to it on audible is a must! She is a classy lady and seems to want to connect with her fans. This sets her a part from the average celebrity and places her in the exceptional category! What about Toni Tennille’s performance did you like? I feel like she is speaking personally to me as she tells her story. She conveys her life's journey in a way that invites the reader to want to know her. I also like that she has not been a part of the celebrity-scene party life! She seems to be a highly loyal individual who possess exceptional character! She is also an excellent musician! I never understand the depth of her contralto voice until I recently listened to ALL of her music over the years! Yes! I loved listening to her! Her speaking voice is as wonderful as her singing voice! This is a woman you will want to know more about! You will glean a lot of wisdom from her experiences.